This riverside circular walk explore the town of Tewkesbury in Gloucestershire. It's a great place for waterside strolls with the River Avon and River Severn running past the town. The walk starts in the town centre near to the 12th century Tewkesbury Abbey. You then follow trails north along the River Avon, passing the attractive meadows at Severn Ham. There's lots of pretty wildflowers to see here in the summer months. 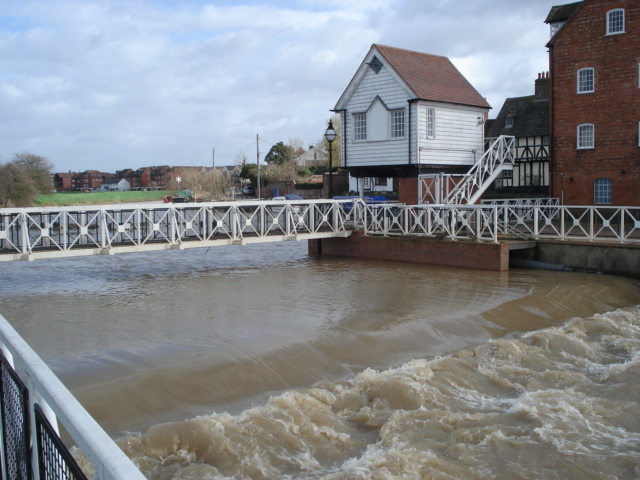 Just before Tewkesbury Quay you cross the bridge and follow the Avon round to where it meets up with the River Severn. Cross the Mythe Bridge and head south along the Severn towards Tirley. The route then crosses the Haw Bridge and follows the footpath on the opposite side of the river towards the village of Deerhurst. Take a short detour here to visit the fasctinating Odda's Chapel. The Grade I listed Anglo-Saxon church dates from the 11th century. It is partly incorporated into a 16th or early 17th century farmhouse and was being used for accommodation when in 1865 its historic significance was realised. After exploring Deerhurst continue along the Severn Way back to the town centre and the finish point. This walk makes use of two long distance trails which runs through the town. You can extend your walking in the area by continuing along the Severn Way or Shakespeare's Avon Way. You can also pick up the Gloucestershire Way and head east towards Oxenton. Worcestershire Way - This walk takes you from Bewdley to Great Malvern where you can enjoy splendid views of the Malvern Hills.